Chinese researchers have discovered and characterized a sophisticated mechanism in bird feathers that enhances tear resistance, overturning a centuries-old explanation of how bird feathers work. The newly discovered cascaded slide-lock system is composed of flexible hooklets, a slide rail, and spines at the end of the slide rail as terminating structures. This finding demonstrates that the superdurability of bird feathers against tears derives from their cascaded slide-lock system, not from the "hook-groove system" proposed centuries ago. Results were published in PNAS in an article entitled "Repairable cascaded slide-lock system endows bird feathers with tear-resistance and superdurability." Bird feathers have aroused tremendous attention for their superdurability against tears during long flights through wind and even bushes. Although feathers may inevitably be unzipped, the separated feather vanes can be repaired easily by bill stroking, which shows the strong advantage of feathered wings over the membrane wings of bats and butterflies. However, the mechanism underlying bird feathers' superdurability against tears had previously been unclear. 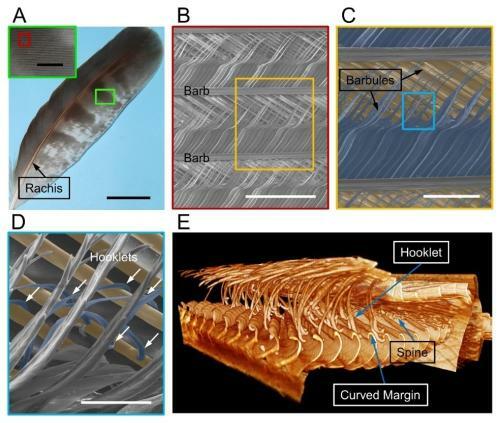 Since Hooke drafted the first rough model of feather structures in 1665, many efforts have been made to explore the structure and function of feathers. Microscale hooks and grooves have been observed and illustrated using optical and electron microscopy. Unfortunately, to date, the superdurability of feathers against tears has remained linked to the interlocking hook-and-groove model, which ignored the fine structures in feathers and could not adequately explain their superdurability. Researchers from the Technical Institute of Physics and Chemistry (TIPC) of the Chinese Academy of Sciences recently made a deep observation of the 3D fine structures and the entire unzipping process of feathers by using microscopy with a micro/nano manipulating system and 3D X-ray microscopy. They observed a repairable cascaded slide-lock system, comprising hooklets, a slide rail, and spines at the end of the slide rail as terminating structures. They were also able to clearly discern the function of each part. The hooklets can slide along the slide rail in reverse when affected by external forces. The sliding hooklet can be locked by the spine at the ends of barbules when larger pulling forces are applied and slide even farther away due to the unzipping of the interlocking structure with large deformation of the barbules. This system not only enhances the separation force of adjacent barbs, but also prevents damage to the barbs during separation. The separation force of adjacent barbs can be maintained above 80% of the initial value even after 1,000 cycles of separation and repair. That is, this cascaded slide-lock system of feathers ensures their superdurability and high self-repair capability, thus helping birds survive in hostile environments. These findings also provide insight into the design of smart textiles and flexible devices. This research was financially supported by the National Natural Science Foundation of China, the Top-Notch Young Talents Program of China, the National Research Fund for Fundamental Key Projects, the Key Research Program of the Chinese Academy of Sciences, and the 111 Project Grant.